SHOPS Warkworth Village has a number of shops, all on Castle Street and Dial Place. They are mainly gift-type shops although there is one general dealer/post office/newsagent in the village. 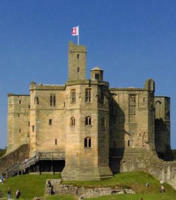 More information on Warkworth Shops, Galleries and Cafes coming soon..... Residents of Warkworth generally travel to Amble to do their main food shopping and make use of the, hair/beauty salons, cafes, clothes shops, bank and garage in the town. Check out www.amblenorthumberland.co.uk for information about shops and businesses in nearby Amble.